No. 1 Cal men’s swim and dive kicks off its calendar year with a pair of invitational tournaments this weekend, as the swimmers stay in Berkeley for the Cal Invitational while the divers head down to Los Angeles for the UCLA Diving Invitational. The teams will be competing in different ends of the state; yet, they will both be at Spieker Aquatics. 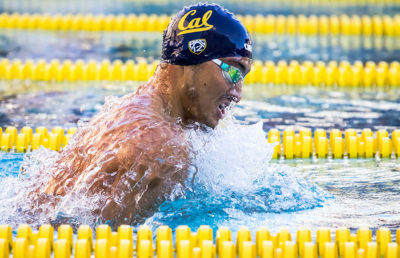 Cal’s swimmers will look to continue right from where they left off in December, when they posted nation-best times in four of five relays en route to a statement victory at the Georgia Fall Invitational. Senior Justin Lynch, who was a part of all four nation-leading relay swims, was also given the Pac-12 Men’s Swimmer of the Month honors for December. He made his mark on the individual leaderboards as well, posting the country’s second-fastest 100 free time with a 42.01 swim at Georgia. 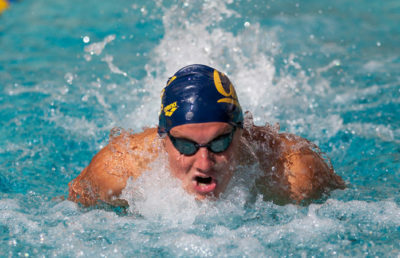 Lynch was one of four Cal swimmers to swim NCAA A times in the fall, which guarantee admission to the national championships in March. Senior Matthew Josa won the 100 fly at Georgia in 45.28, the second-fastest time in the country thus far. Meanwhile, sophomore Quah Zheng Wen and junior Mike Thomas qualified via the 200 fly. The Bears will have the comfort of home waters for only the second time this season. In its lone home meet of the fall, Cal won all but one event in the Triple Distance Meet against Stanford. The Cal Invitational will be the first of three home meets at Spieker Aquatics Complex in the spring. The divers, on the other hand, will head to UCLA’s Spieker Aquatics Center, where they will take on some of the best divers on the West Coast. Cal will send all four of its male divers to compete against a larger-than-anticipated pool of competitors after another competition was canceled. “Over the break, we’ve been training, learning some new dives, fine-tuning technique and getting acclimated to our zone pool and the altitude,” said Cal diving coach Derek Starks. High-intensity training intersected with high altitude as Cal divers spent the last two weeks in Flagstaff, Arizona, the site of the NCAA Zone E Diving Championships. Sophomore Connor Callahan and freshman Johnny Robinson have already qualified for Zones, the round preceding the national championship, with Callahan doing so at Utah in October and Robinson at NAU in November. Freshmen Jackson Gabler and Jared Kloos will work toward joining Callahan and Robinson in March. Gabler will look to build on an impressive performance at the NAU Lumberjack Diving Invitational, in which he fell just short of qualifying by two-tenths of a point, whereas Kloos will be making his competitive debut this weekend. The format of the three-day diving meet is the same as the Zone E Championships, with 1-meter, 3-meter and platform competitions taking a day each. The top 18 from the preliminary rounds will enter into the finals.